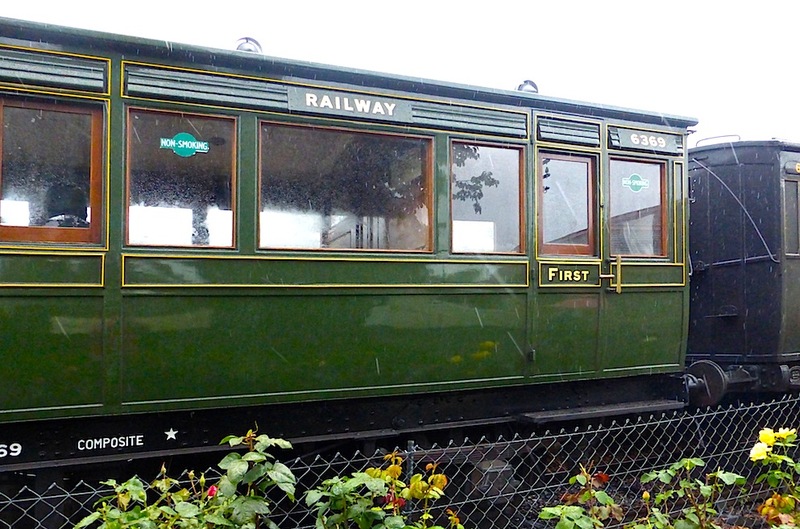 Passengers on the railway are guaranteed to be travelling in a carriage at least ninety years old, the most modern carriage in regular service having been built in 1924 and the oldest in 1864! — "Carriages and Wagons"
A First Class carriage of the LCDR (London, Chatham and Dover Railway), this four-wheeled Saloon Compact 6369, originally built in 1887 as a six-wheeler, had known service on the Isle of Wight but had eventually been used as a bungalow. Part of a set of two, it is now in regular use on the heritage line, and, "when hauled by an olive green 'Terrier,'" is truly a recreation of travel from a bygone age" ("4 wheeled carriages"). 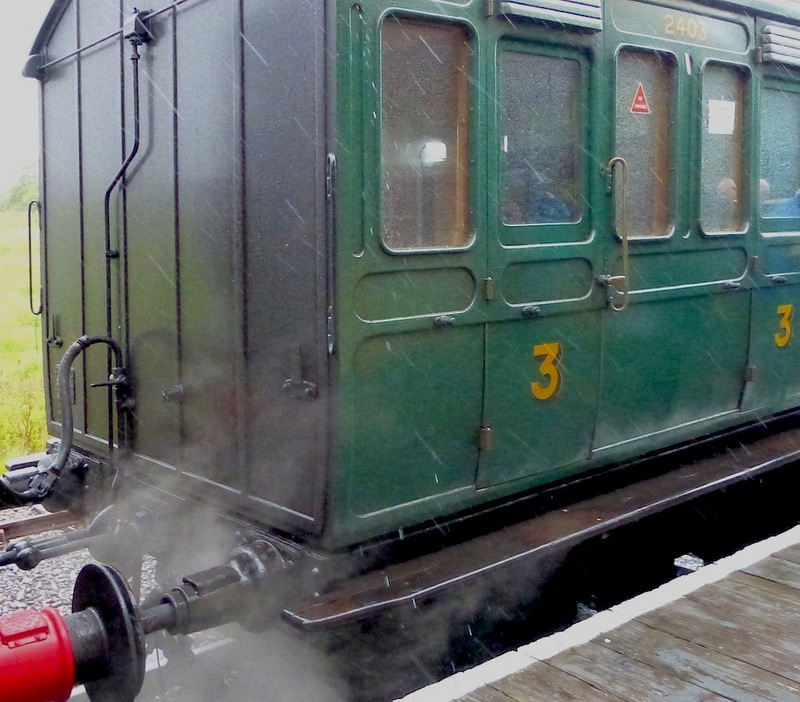 This 2515 LCDR five-compartment third class carriage was originally built in 1894. It was once a six wheel four-compartment "Brake Second," but was downgraded to a "Brake Third" in about 1899" ("4 wheeled carriages"). At one time this had also been used as a bungalow (a fate which clearly befell a number of carriages when they went out of service). 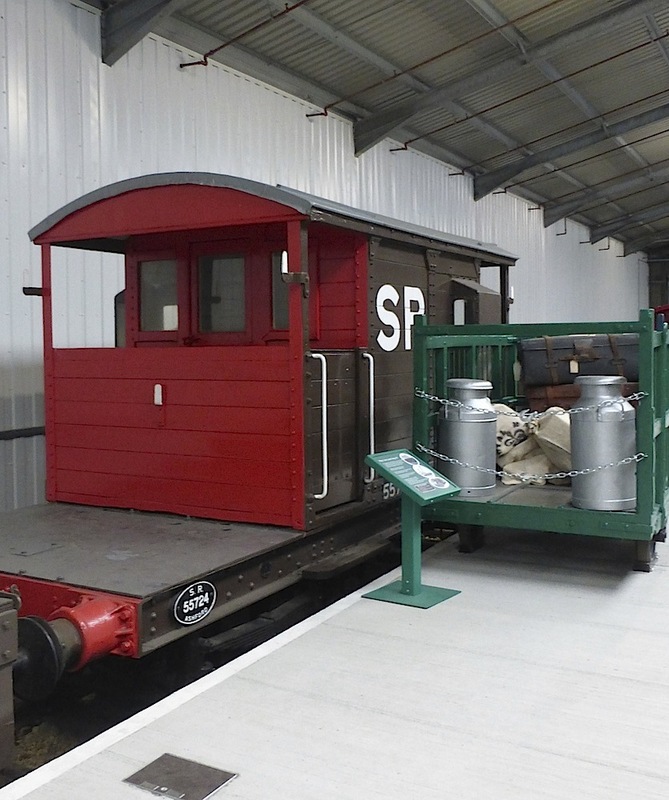 Having been brought to Havenstreet in 1981, it was throughly restored (including having provision made for wheelchair access), and mounted on parcel van's underframe. 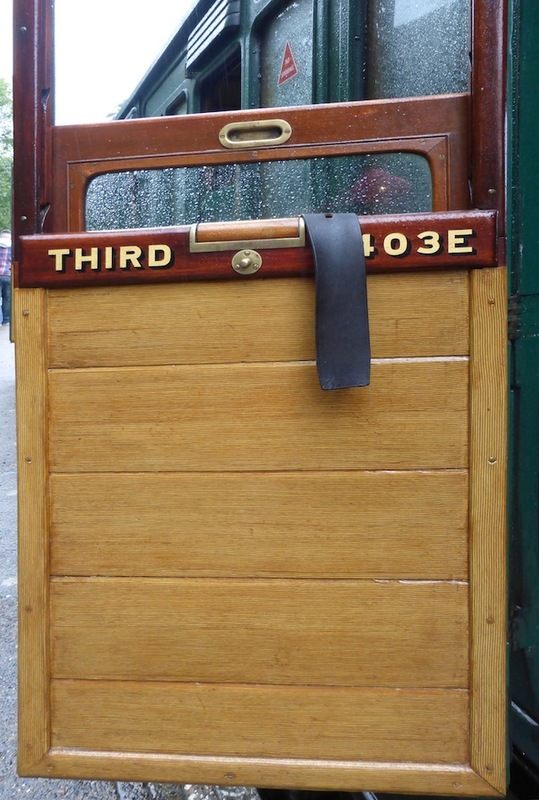 However, the appearance is still very much what it would have been in Victorian times, and it is reported to have been the overall winner at the 2002 Heritage Railways Association Carriage and Wagon competition in 2002 ("4 wheeled carriages"). A nice success story! Left to right: (a) Partial view of SR (Southern Railway) 2403. (b) Door to a compartment. (c) Another partial view of the carriage. SR (Southern Railway) 2403 was used by the LBSC (London, Brighton and S. Coast Railway). 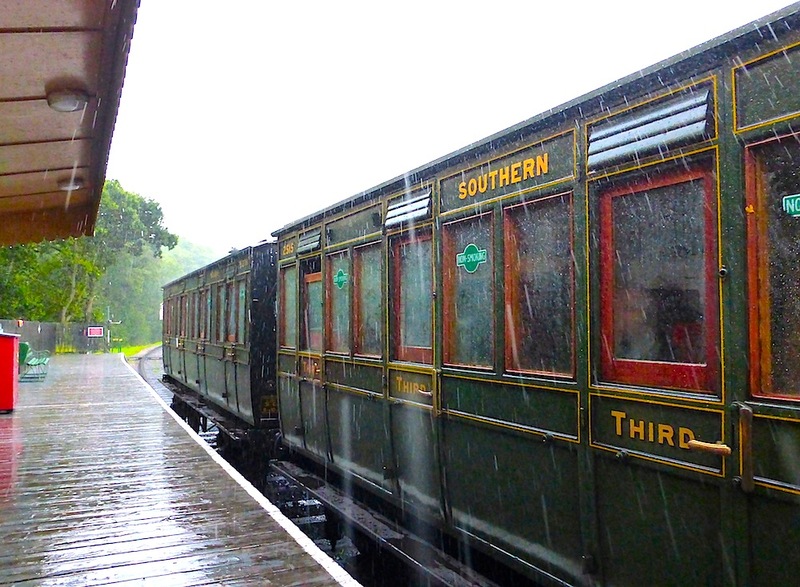 This is a third class carriage originally built at Brighton in 1903. 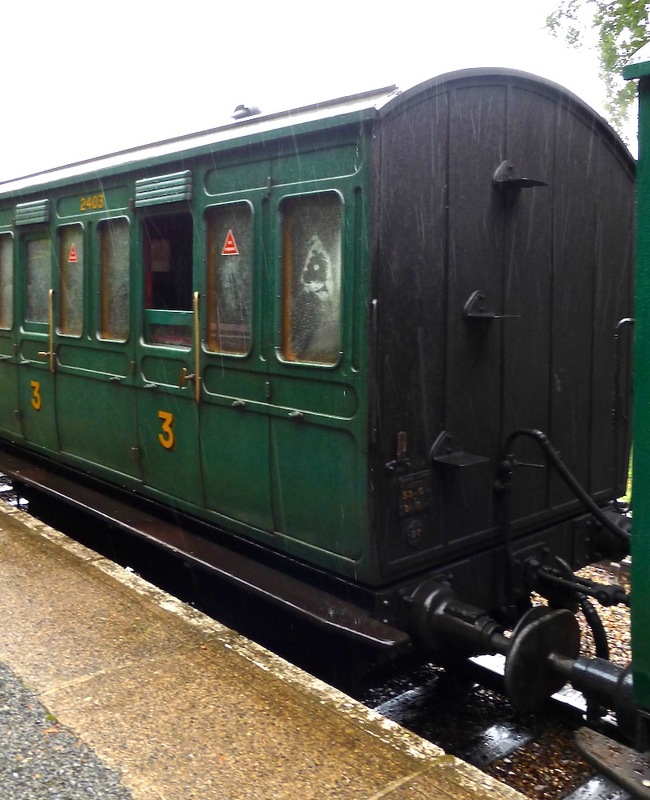 Unlike other carriages here, it had never been in service on the Isle of Wight, but two just like it did run in the island once. It came to Havenstreet in 1991. Again, restoration involved making provision for wheelchair use. It began carrying passengers in 2012 ("Bogie Carriages"). The door has a strap enabling the window to be pulled up and down, and slightly backwards and forwards, to fit in slots at the side. It is kept in place by fastening the strap to the brass fitment at the bottom. There is no corridor on the train. Left: A SR (Southern Railways) goods brake van from the early 1930s, with milk churns and mail sacks in the luggage cage alongside. Right: A calf float, complete with model calf. 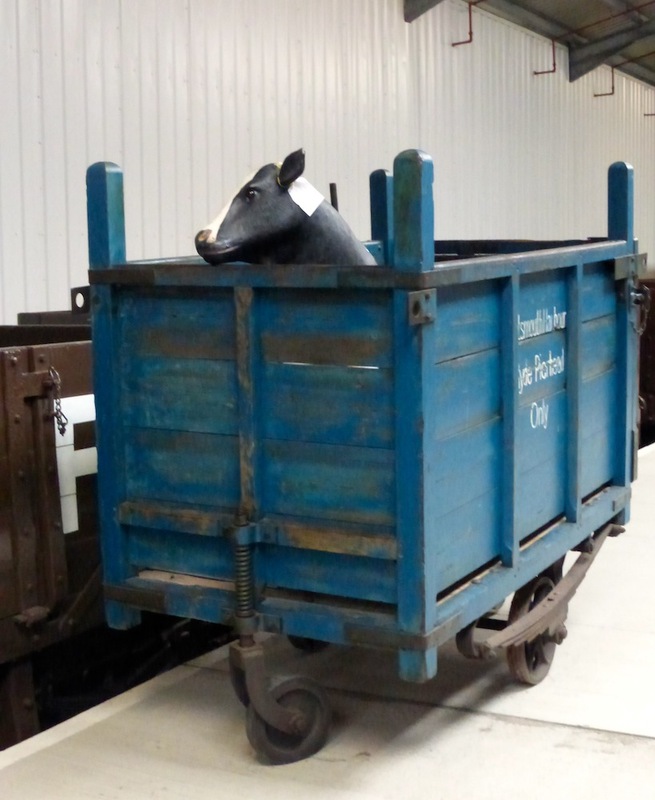 A selection of wagons for goods (such as milk and mail) and animals (such as calves) were kept from the time when British Rail services were withdrawn from the Isle of Wight in 1966 (see "Carriages & Wagons"). A signboard in this part of the "Train Story" Discovery Centre tells us that goods were transported back and forth across the island in this way, between the Portsmouth Harbour ferry and the pier-head at Ryde (the ferries themselves were run by Southern Rail as part of the system). The signboard also mentions that the design of the luggage cage dates back to the 1880s. These are not just ancillaries: they give a real flavour of what the trains were used for and looked like in earlier times. Photographs, text and formatting by Jacqueline Banerjee, who would like to thank the Isle of Wight Steam Railway's "Train Story" Discovery Centre for permitting photography. You may use these images without prior permission for any scholarly or educational purpose as long as you (1) credit the photographer or source and (2) link your document to this URL in a web document or cite the Victorian Web in a print one. "4 Wheeled Carriages." Isle of Wight Steam Railway. Web. 12 August 2017. "Bogie Carriages." Isle of Wight Steam Railway. Web. 12 August 2017. "Carriages & Wagons." Isle of Wight Steam Railway. Web. 12 August 2017.